Environmental policy may produce effects which go beyond the scope of the specific policy’s initial aim. Reforestation, for example, generates positive benefits not only in the shape of climate protection but also in the shape of the combat of biodiversity loss and it may also raise the attractiveness of a region for tourists. There are several examples of environmental policies, generating initially unintended co-effects. These co-effects are not always positive, of course. This book addresses the wide range of (co-)effects associated with environmental policies which may increase or decrease the attractiveness of these policies. Therefore, the book’s scope goes beyond the standard economic analyses, which regularly postulate a specific cause-and-effect chain. The complexity and wide range of benefits is investigated from different perspectives and by means of different methodologies. Among the environmental policies discussed are climate mitigation policies as well as adaptation policies. The inclusion of all relevant effects of environmental policy (and therefore not only of the primarily intended effects) tends to have a strong impact on the efficient policy design. 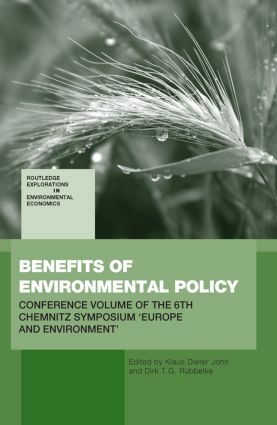 The areas which are covered by the book will be of great interest mainly for economists (environmental economics, ecological economics), ecologists and political scientists as well as practitioners, scientists and policy makers.